For my money, Hammer Fight is a hard rock band who runs that sound through a metal filter, analogous to how garlic bread is still bread even though it has garlic butter and cheese added to it which hit the taste buds first and make it appealing.1 An obvious influence is Motörhead’s energetic Bastards, and a little bit of Thin Lizzy’s heaviest record Thunder and Lightning. With this in mind, the fun-lovin’ Exodus of Fabulous Disaster is implemented to make the riffs bigger, the chugs chunkier, and the whole package that little bit faster and harder. Bassist Drew Murphy handles vocals, and sounds like Jamey Jasta after a three year binge on cheap whiskey and cigarettes. 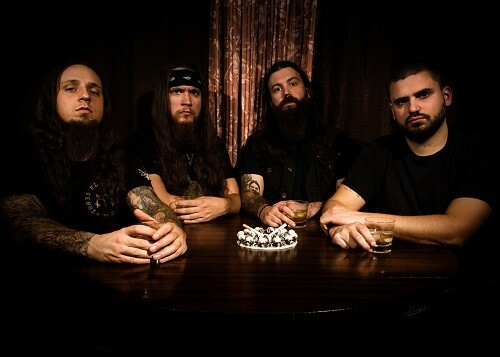 He also adds in the melodic Phil Anselmo-ish inflections to his voice that Jasta performed on those Kingdom of Sorrow records we all forgot about. Luckily Profound and Profane isn’t something I’ll be forgetting about too soon. Hammer Fight knows their style and its limitations, making short, simple, and catchy tunes that get the foot tapping and the head nodding along. Most songs follow a similar and simplistic formula revolving around verse and chorus repetition, but tend to introduce another idea somewhere in the middle to spice things up a bit. Opener “Picking up Change” does precisely this, and breaks into an Exodus style chug in its midsection followed by a good solo. Parts of “Target Acquired” reminded me of the best material from metallic punk band A Wilhelm Scream, so it winds up being energetic, catchy, and fun stuff, albeit less technical than Wilhelm. “Good Times in Dark Ages” follows suit but rides a more melody-laden slowdown before a solo instead. “Gods of Rock n’ Roll” may as well have been Exodus covering parts of Bastards if the odd Thunder and Lightning lick got in there, and works out to be as fun as such an endeavor should be. Like any band that adequately follows a good style, Hammer Fight isn’t in the business of writing bad songs. They do, however, write okay songs that don’t stick in the craw as well as other material here. This is largely characteristic of Profound and Profane’s second half; “Private Stock” tries to be comparatively more extreme and sounds like passable Exodus outtake riffs instead. “Cell Mates” shoots for being downtrodden and bluesy and Terror levels chuggy at the same time and sounds a little lost. “Cell Mates” stands in contrast to this is album highlight “Low & Broken” which is a downtrodden blues song and sees Murphy’s vocals being strained but earnest, culminating with the whole band kicking in for a killer ending solo. “West Side Story” is the token pure metal song here,2 and it lacks the fun catchiness of the best material on Profound and Profane. Not bad, but largely meh. Hammer Fight is a fun band and Profound and Profane is a fun record. It’s not perfect, and it’s not Alestorm for 2016 in terms of ridiculously fun, all killer no filler records, but it’s good. The master is loud and the drums are way up in the mix, but given that this isn’t exactly technically minded music that doesn’t matter as much as it would elsewhere. If this were an EP comprising the first half of the record, I’d have given it a much higher rating. The second half isn’t bad, as “The Ultimate Sacrifice” and “Cult of Conceit” are good tunes and the worst songs here aren’t horrible at all. 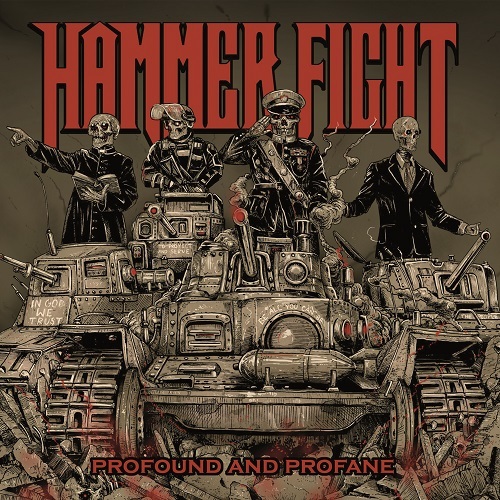 I’d gladly see Hammer Fight live, and I’ve compulsively listened to the first half of Profound and Profane a whole bunch of times, but the fact that I’m okay shutting it off after “Low & Broken” concludes means I can’t call it a great record. I can call it a good one though, and I’ll revisit the highlights here throughout the year. If you like fun hard rock tinged metal, I’d recommend you do too.